Steps to the water right on Lake Hamilton. Awesome lake and sunset views, you really will not want to leave. Complete with full service kitchen and washer / dryer just bring your clothes and be prepared to relax. You are located right off of Central Avenue (Highway 7 South) and are close to all activities. Magic Springs and Crystal Falls is about 7 miles, Hot Springs Mall, Grocery Stores, Restaurants, and more is less than a mile away. If you want to have peace and quiet and close to all activities this is the place. Gated community with pool. My wife and I started purchasing Lake properties 7 years and have been blessed to add 1 per year and each one get better. Each property is unique and we take pride in keeping them modern and fully stocked with what our guests need. We currently have 9 in the same complex. 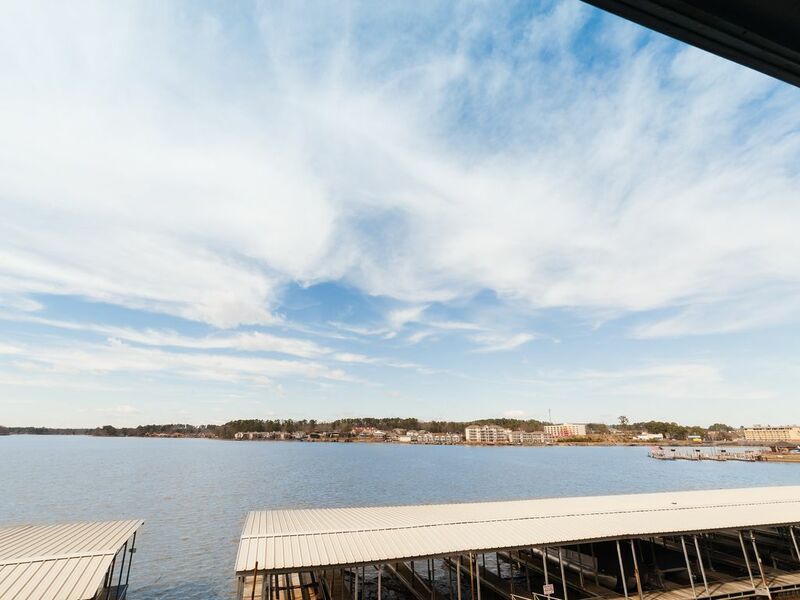 Incredible Views, convenient location, gated, boat slip, and pool. Its a perfect get away and close to everything. Close to all activities and restaurants with pool. Very nice condo. Updated and great location. Would definitely stay here again! Excellent location close to restaurants. This is an older unit, but it has been updated and is well maintained. Park directly in front and walk straight in on the same level. Perfect view of the lake and sunset from the balcony. There is a little bit of traffic noise but not bad at all. Grounds are very clean and check in/out is a breeze as long as you have a cell phone. The unit had everything we needed with regard to dishes, linen and towels. The washing machine is a bit loud but works fine. There is WiFi, however it is a little slow. The water pressure left a lot to be desired but it served the purpose. Overall we were very pleased and we will definitely stay here again when in this area. We would certainly recommend to anyone traveling to Hot Springs. The condo is very nice. Well kept, clean, and everything you need, while away from home. Beautiful views, and easy access to restaurants, and attractions. Highly recommended. Can’t wait for our next trip. Very nice. Clean & recently remodeled. Enjoyed quiet area & view of the lake. All of the accommodations were above average! We felt like we were at home. The beds & furniture were comfortable. We would love to return to this rental! Thank you! We welcome you back anytime. The views from the condo were gorgeous and the lake was literally your backyard. Outside deck furniture was worn and the docks below gave off a smell that did not make it favorable to enjoy being outside. The condo was cozy and well decorated but the floors were dirty, mold in the washing machine and the comforter had a stain on it. There is supposed to be housekeeping but we were asked to do a lot of cleaning and prep that I felt housekeeping should take care of under the cost per night for this stay. I recommend investing in some higher quality dish soap, detergents and hand soap. Overall it was a nice stay, very relaxing. The complex was clean, quiet and peaceful.